Enos A. Mills was a legendary character, remembered now as the Father of Rocky Mountain National Park. He burst on the national scene in a most unlikely way: as "the official state Snow Observer." The State of Colorado hired him to measure snow depths in the Rocky Mountains and his exploits as a hiker and mountain climber thrilled the nation. He travelled lightly, ate sparingly and was indefatigable, travelling 170 miles on one trip, 70 miles on snow shoes. Then in the summer, he entertained dudes from the East with hikes in the mountain from his Estes Park lodge. Beavers have a talent for creating a sympathetic bond with those who observe them and because of that observers often find quite a bit of their own personality in beavers. In his first chapter, "Working like a Beaver," Mills captures his own personality as he describes beavers: "The beaver often does a large amount of work in a short time.... 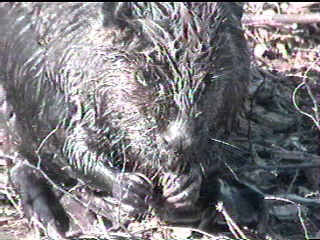 Although the beaver is a tireless and an effective worker, he does not work unless there is a need to do so. Usually his summer is a rambling vacation spent away from home." Like Mills, the beaver was all exploit in one season, a Whitmanesque loafer in other seasons. Mills's prose is manly, which is to say, direct, spare yet touching all the bases. For example he writes: The beaver "is accomplished in the use of arms and hands. With his hands he is able to hold sticks and handle them with great dexterity. Like any clawing animal he uses his hands or fore paws, to dig holes or tunnels and to excavate burrows and water-basins." One cannot quarrel with any of that, yet how unlike a beaver it sounds! Just the other day I was standing above a hole the beavers had made in the ice. One emerged from the pond, shook a myriad of little sticks off its back, paused,and then came up on the snow, treading lightly, its forepaws playing below his nose seemingly with the sensitivity of a virtuoso pianist negotiating a pianissimo. Then it stopped and brought up, in both paws, a tiny twig that I could hardly see, and for a minute it furtively ate that. There was no swagger, no clutching and grabbing. The beaver struck me as scholar hunched over a coveted cup of tea. And perhaps to you, it looks like, well, a typical rodent eating in a typically rodent like manner! Before moving on to substantive issues in Mills's book, I don't want to leave the impression that he is a dull, stacatto-syle writer, just giving the facts. He can paint a lively and charming word picture, for example: "It is in standing erect that the beaver is at his best. In this attitude the awkwardness and the dull appearance of all-fours are absent, and he is a statue of alertness. With feet parallel and in line, tail at right angles to the body and resting horizontally on the ground, and hands held against the breast, he has the happy and childish eagerness of a standing chipmunk, and the alert and capable attitude of an erect and listening grizzly bear." I can't fault that, save to say that, to me, the standing beaver often looks constipated!